Allied Security supply and install or supply only all makes of Freestanding or Under Floor Safes and Freestanding Data Fire Cabinets including Dudley, SMP and Chubb to name but a few. We have installed safes to virtually every Retail Park and Shopping Centre in the South of England for household name companies. If you are looking for a low cost safe, please contact us as we have hundred’s of second hand reconditioned safes available for immediate delivery at very low prices. The majority of safes we supply are to conform to insurance requirements. Safes are available from £2,000 to £100,000 overnight cash cover. Jewellery cover is normally ten times the cash cover, therefore a £2,000 overnight cash cover safe may be used for up to £20,000 of jewellery, although we recommend that your insurance company is consulted as insurance ratings differ. Safes are available with single or double key locking, mechanical combination locking and instant or time delay electronic locking with the ability to provide an audit trail of when the safe was unlocked. In addition, we can supply safes with manual deposit chutes or safes with Air Tube deposit systems. These provide the ability for staff members to deposit money in to the safe without having access to the safe or even the room where the safe is located. We recommend that all freestanding safes should be fixed to the wall or floor with specialised safe fixings thus ensuring the safe cannot be removed from the premises easily. 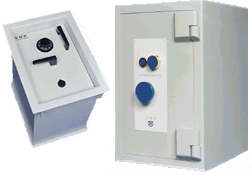 Our recommended safe manufacture is SMP, their safes provide a good balance of quality and value for money. 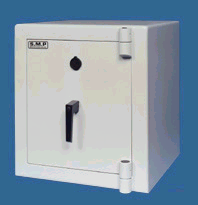 The most common safe we supply is detailed below, please contact us for prices of lower or higher quality / priced safes. High Security 7 Lever Anti Drill Keylock as standard. Combination & Multi Locking is available upon request. Insurance Approved Cash Rating £3000 / £4000. Price listed below Includes delivery and installation to a ground floor location.